Artist's impression of the ExoMars 2016 mission, including the Trace Gas Orbiter and Schiaparelli, a small landing demonstrator module. Missions to Mars have never been easy. On March 14, Europe and Russia are scheduled to launch the first phase of the two-part ExoMars program toward the Red Planet. The spacecraft will carry an orbiter and a soft lander; the second phase, scheduled to launch in 2018, will send a rover to the Martian surface. In 1960, the Soviet Union became the first country to attempt to send a probe to Mars. The then-unnamed probe (it has seen been referred to as Marsnik 1, Mars 1960A and Korabi 4) failed to leave Earth orbit. The Soviet Union suffered a string of 10 failed Mars missions until finally, in 1971, the Mars 3 orbiter reached its destination. This probe studied Mars for eight months before landing on the planet's surface, where it was able to collect 20 seconds of data before shutting off permanently. The United States' first attempted Mars mission was Mariner 3, which launched in 1964. The probe's solar panels failed to open, so it could not take up orbit around Mars. But, Mariner 4, also launched in 1964, succeeded in its mission, becoming the first human-made probe to study the Red Planet up close. During Mariner 4's brief flyby, the probe sent back 22 images and came to within 6,118 miles (9,845 kilometers) of the Martian surface. In 1969, the United States launched two more successful Mars flyby missions: Mariner 6 and 7. In 1971, Mariner 8 was lost in a launch failure, but in November of that year, Mariner 9 became the first artificial satellite to orbit a planet other than Earth. It returned more than 7,300 images of Mars. Beginning in 1973, the Soviet Union experienced a period of limited successes with its Mars program. The Mars 4 probe reached Mars but failed to go into orbit, although it did return some images and data. Mars 5 successfully entered into orbit around the Red Planet in February 1974. In March of that year, the Mars 6 orbiter/soft lander reached Mars, but the lander failed on its descent. The lander did manage to return some data from the Martian atmosphere, however. The Mars 7 spacecraft failed to go into orbit around Mars as planned in 1974, and while the mission's lander was released, it missed the planet. According to NASA's history office, Mars 7 and four of the U.S. Mariner probes are now orbiting the sun. In 1975, the United States launched its Viking 1 and Viking 2 orbiter/lander Mars missions. Both Viking 1 and Viking 2 touched down on the planet's surface in 1976. With the exception of the 20 seconds of data received from Mars 3, the Viking landers provided the first on-the-ground data from Mars. Together the two probes went on to collect over 52,000 images. In 1988, the Soviet Union launched the Phobos 1 orbiter and the Phobos 2 orbiter/lander to study Mars' larger moon, Phobos. But controllers lost contact with Phobos 1 before the probe reached its destination. Phobos 2 entered into orbit around Mars but failed before it could drop its lander on the nearby moon. After launching the failed Phobos probes, the nation's Mars missions became much more infrequent. In 1996, Russia (the Soviet Union collapsed in 1991) mounted the Mars 96 mission, which consisted of an orbiter, two landers and two soil probes. But the mission was lost in a launch failure. In the 1990s, the United States experienced two Mars mission successes and a total of four mission failures (this latter tally includes the Mars Polar Lander and the two Deep Space 2 impact probes, which were considered separate missions, even though they were launched together). Among the country's successes was Mars Pathfinder, the first rover on Mars. It landed on the Red Planet on July 4, 1997, and worked for five years longer than expected. Since 2001, the United States has had a stunning run of seven straight successful Mars missions, including three rovers. NASA's Mars Curiosity rover, which landed in August 2012, continues to provide on-the-ground information about the Red Planet, and the agency's most recent Mars probe, MAVEN (Mars Atmosphere and Volatile Evolution), has helped scientists explain what happened to Mars' ancient atmosphere. Meanwhile, the Mars Reconnaissance Orbiter (MRO), launched in 2005, has helped scientists identify locations where liquid water appears to exist on the Martian surface. NASA's Mars Curiosity Rover took this self-portrait on Jan. 19, 2016. Curiosity comes from a long line of Mars missions, some of them successful, many of them not. 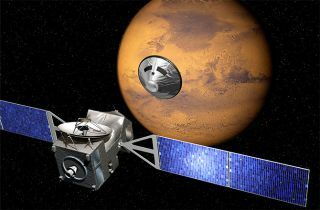 In 2003, the European Space Agency (ESA) experienced a partial success with the Mars Express mission, which included the Mars Express Orbiter and the Beagle 2 lander. ESA lost contact with Beagle 2, but Mars Express is still orbiting the Red Planet, more than a decade after arriving. India joined the Mars race recently with the Mars Orbiter Mission, also known as Mangalyaan. The probe reached Mars in September 2014 — the same month as MAVEN — and continues to operate beyond its initial mission time frame. In 2011, Russia and China launched a joint Mars mission called Fobos-Grunt. Due to a malfunction, the spacecraft got stuck in Earth orbit, eventually falling back to Earth. But the March 14 ExoMars launch gives Russia another chance at the Red Planet. ESA leads the ExoMars program and is building most of the hardware; Russia is providing the Proton rockets for both launches, as well as some flight gear and science instruments. The first phase of ExoMars consists of an orbiter that will hunt for methane — a possible sign of Mars life — in the planet's atmosphere and a landing demonstrator, which test landing technologies for the program's rover, which is scheduled to launch in 2018.